There are a lot of car lovers around but not all of them love driving as much. Driving needs to be fun and enjoyable yet this is something where most of the cars miss the mark. Unless you have invested in a high-end luxury sport car, you are most likely to drive a very dull car with low power, sluggish handling and no road feedback. However, even the experience of driving an exotic luxury car becomes a completely repulsive nightmare due to one problem - heavy steering. When it comes to steering, a majority of Japanese economy vehicles are neck to neck with European exotics. Yet, heavy steering can strike any car, anywhere and anytime. This is mainly because it is caused by small issues we usually tend to overlook. Over the time, these issues manifest into bigger problem that greatly hinder the overall driving experience. Heavy steering is not only tiring and frustrating, it is also extremely dangerous. If you feel your car's steering requires extra force and power, it is best to start inspection for underlying issues. Since, mechanics and service centers tend to overlook problems as well, you need to first identify the problem yourself. Let's take a look at the common reasons behind heavy steering and how you can spot the main problem area in your car. When the engine gets too heated, it is not possible for the engine oil alone to control the temperature. The radiator is where the heat extremes from the engine are transferred to. For this purpose, radiators have a special liquid with amazing cooling properties. This is what we usually call anti-freeze or coolant. Coolant is water with added additives (ethylene glycol) bearing a very low freezing point and a very high boiling point. Due to this property, they are able to handle up to 300 degrees, i.e. the extent to which your engine can heat up at times. If you are driving a self-shifting car, you don't have to worry about shifting gears at every nook and corner, but you do have to worry about one more fluid - the Automatic Transmission fluid. ATF is a specialized lubricator formulated to handle valve operations and brake-band friction inside the automatic transmission. It also works as a lubricator for gears inside as well. ATF contains performance enhancing chemicals and there are many variations to meet the specific needs of different self-shifting transmissions. This fluid usually has a pinkish to red tint, or in rare cases green. Due to its special properties, it is also used as a hydraulic fluid in the power steering system. In these systems, ATF keeps the hydraulic pump run smoothly in order to optimize maneuverability. ATF must be replaced within the specified period in order to avoid costly transmission issues. 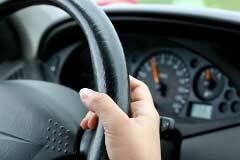 When you hit the pedal, a fluid is pumped from the pedal to the brake in order to bring your car to stop. The purpose is to provide the brakes with the pressure and power required to stop your car. Due to the presence of rubber inside the brake system, this fluid is not petroleum-based. It can be glycol-ether, silicone or mineral oil based. Major properties of brake fluids are its very high boiling point and very low compressibility. You should always maintain the quantity and quality of this fluid in your car. It is recommended to change the brake fluid every two to three years. In many cases, heavy steering can be caused by improper wheel alignment. Check for tire's wear. If the front tire's wear in an unusual or uneven manner, you need to get your car fixed. In such a situation, you will experience a harsh strain on the steering while making turns. This problem is a major threat for your road safety as it hinders control and maneuverability as well. Finally, get a little dirty under your car and check all the bolts, joints and the steering rod in the front section. These balls and joints must be properly lubricated and should not show any sign of wear and tear. Lack of lubrication and heavy wear and tear may also be causing undesirably stiff steering. After successfully identifying the issue, it is always best to get professional help regarding the problem. Also, heavy steering problem can be cause by more than one of these problems. Therefore, make a checklist of all the problems listed above and make sure you have performed complete inspection before finding a solution.